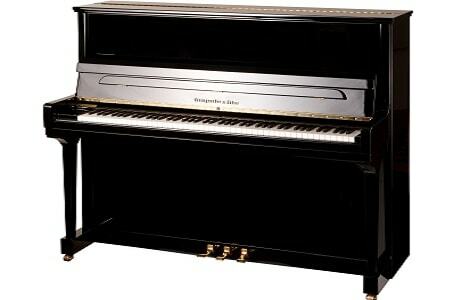 The Model 130 is Steingraeber’s most popular upright piano, awarded the ‘world’s best’ prize for uprights in Paris. The Model 130 is Steingraeber’s most popular upright piano, awarded the ‘world’s best’ prize for uprights in Paris. The Model 130 is often chosen in preference by music conservatoires over mass-produced grand pianos due to the faster repetition, the rich, full and flexible sound. Acoustically and mechanically, this instrument offers the quality of a 160cm grand piano. The Model 130 is an exceptional hand-built German piano which has the additional option of the patented SFM (Steingraeber-Ferro-Magnet) action which perfectly replicates the feel of a grand piano. The tone is well rounded and particularly powerful in the bass, normally characteristic of a considerably larger piano. The action is designed to satisfy the most demanding pianists and the touch of the piano will respond to the subtlest nuance, for all styles of play. Although less widely known than the biggest names in the piano world, the Steingraeber 130 holds its own against the finest instruments in the world. The Steingraeber name is a well-kept secret which should be brought to the attention of more discerning pianists, and anyone who wants to experience the best and most refined pianos made.